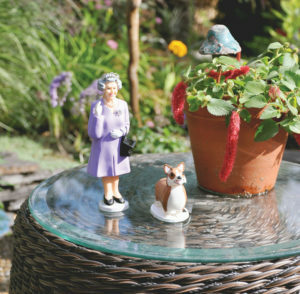 The Queen and her corgi enjoy the garden. 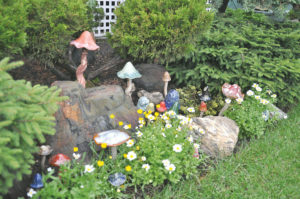 Susan Parker has built herself a garden fit for a queen. 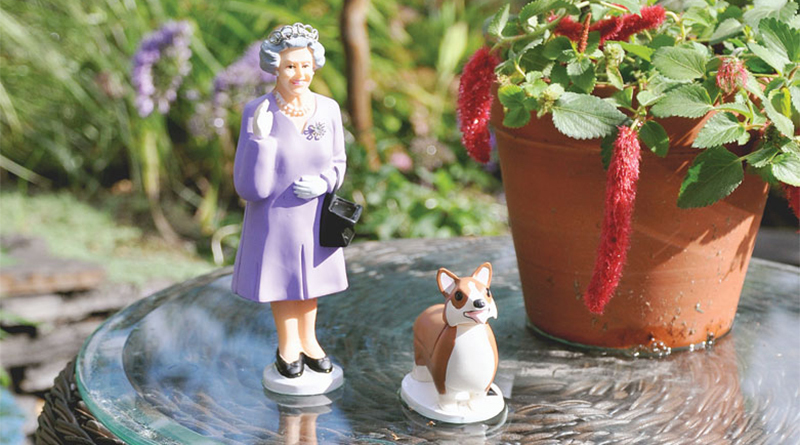 In fact, the Queen resides there with her little corgi, okay so they are statues, but the garden is still befitting for a queen. Susan, born and raised in Manchester, England, made the move to Canada with her husband, Rob, in the early seventies. 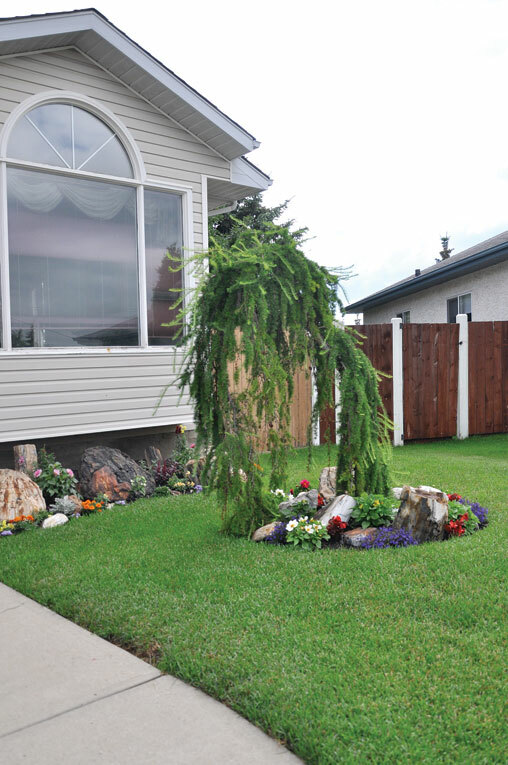 “My husband’s family, his mum and sisters, had moved to Edmonton. 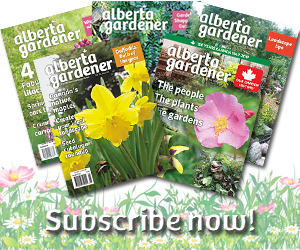 It was a rather depressing time in England; so deciding to be adventurous Rob and I married and hopped aboard a plane to Canada,” says Susan. After living with Rob’s sister for a couple of months, followed by a three month stint in an apartment, they finally were able to buy a home and enjoy their first garden. Susan, who had been immersed in gardening throughout her childhood, was very excited. 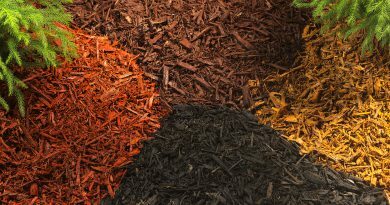 “My grandfather was an avid gardener,” she reminisces. 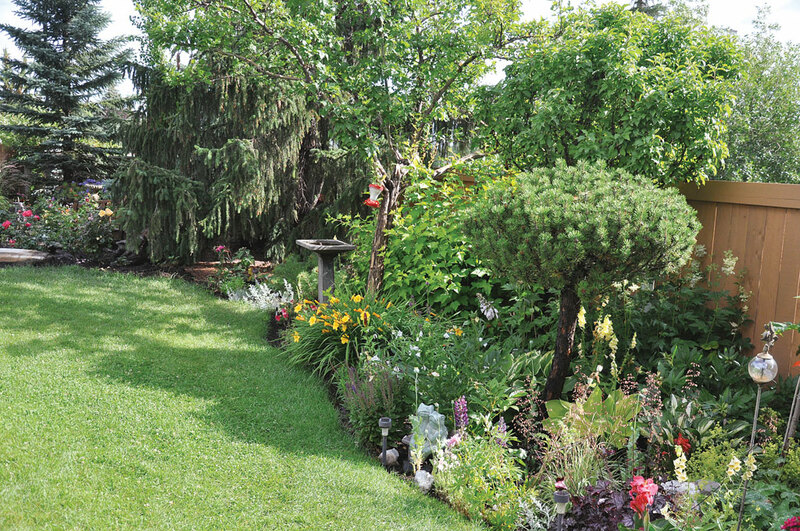 “I have fond memories of working with my him in the garden. 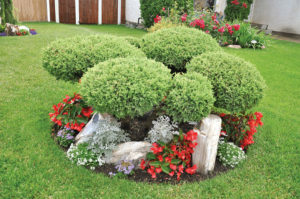 He grew chrysanthemums and entered them in local shows.” So with the gardening gene firmly embedded in her DNA, she was ecstatic to move into her current home in 1990. 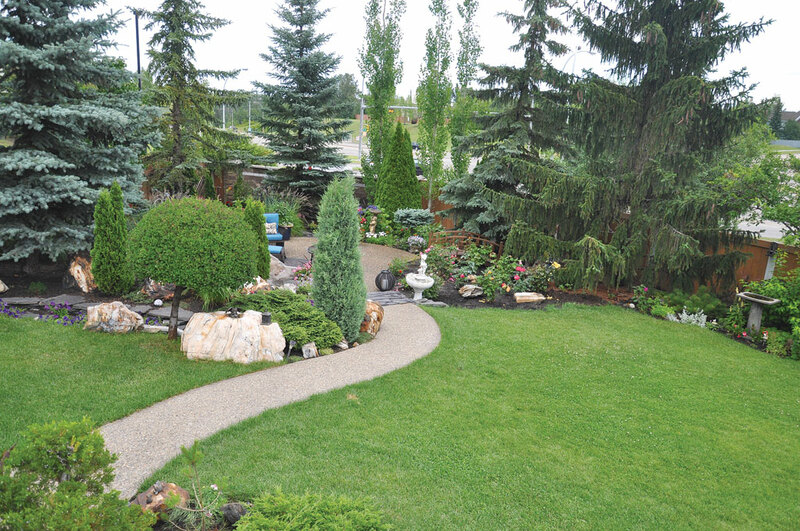 “We both, Rob and I, wanted a big garden,” she says. Greenland Garden Centre provided them with a basic design plan which they used to incorporate the path and patio. In the beginning Rob did the concrete work and pathways while Susan puttered away, happily creating the gardens. 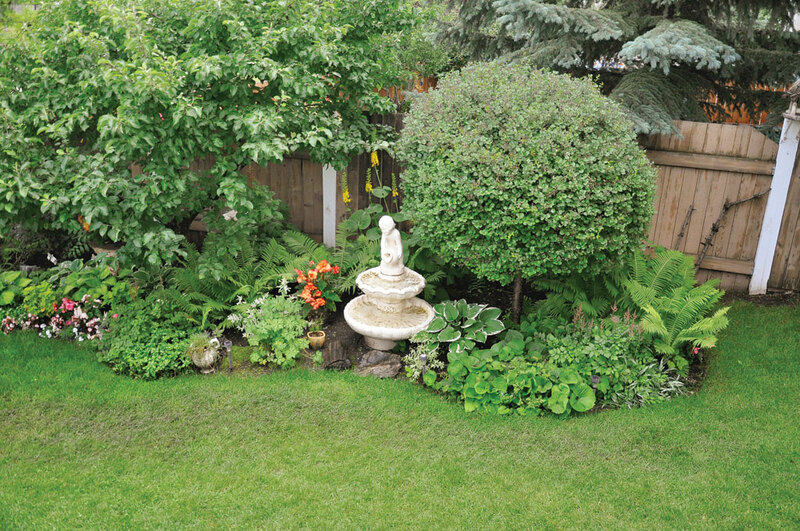 The garden became a place for the couple to forget all their troubles and relieve some stress. 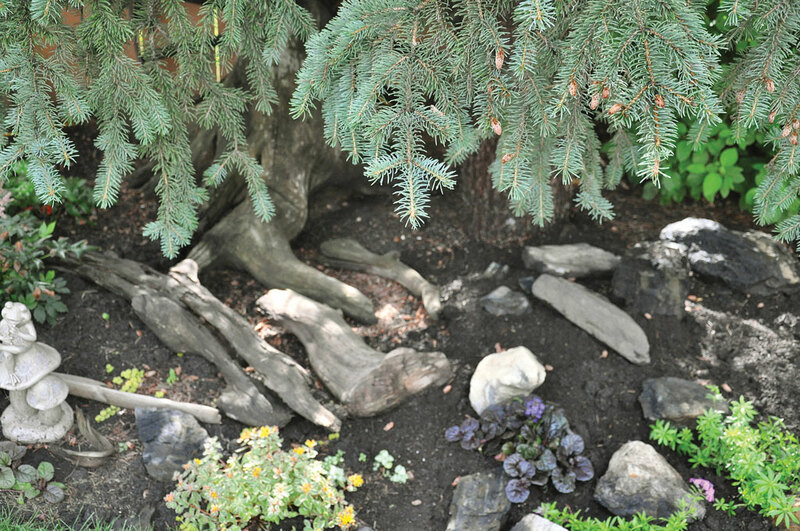 The pieces of driftwood that can be found throughout were gathered on cherished family trips. Susan and Rob would take their children camping and explore, picking driftwood and rocks from a dried up riverbed. 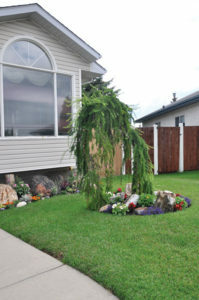 The driftwood bench, made in Thailand, was a purchase from an Edmonton store Susan could not resist. It is a stunning accent piece in the garden. 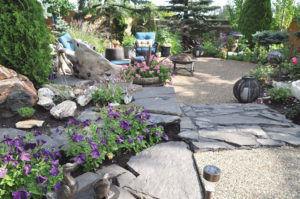 Friends visiting from England helped her husband build the beautiful rock walls, reminiscent of their home land, from stones gathered in Canmore. 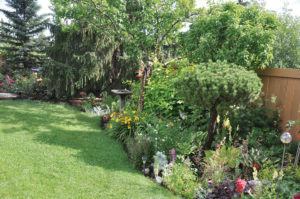 It took fifteen years to get the garden to where it is now, but she isn’t done. Susan is still making changes. 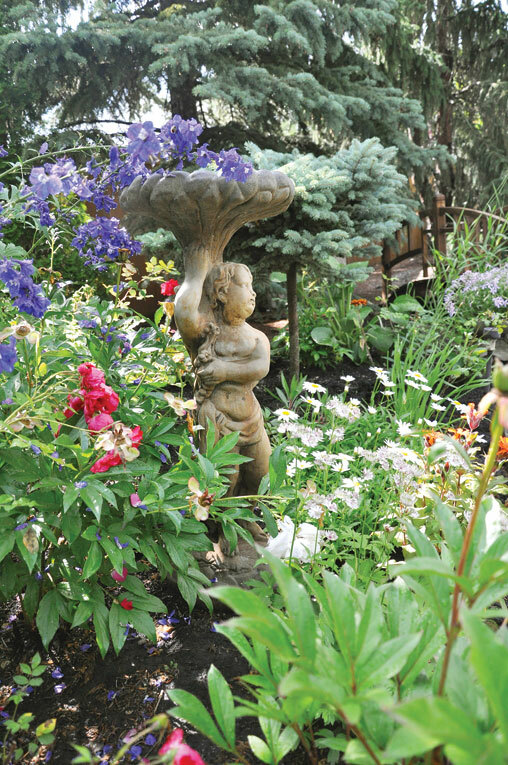 In addition to her outdoor paradise, Susan has brought her love of gardening indoors, where she grows 28 orchids. And, as if that wasn’t enough, she also tends a community plot where she grows her vegetables. Gardening is an obsession and passion for her. 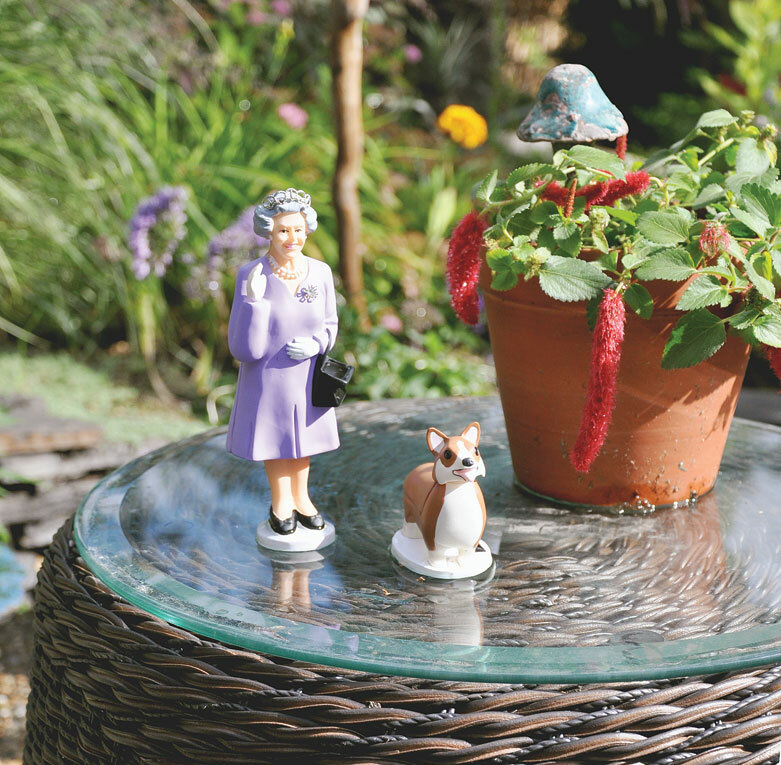 The garden is a place of enjoyment, and when her children and grandchildren come to visit they love being outdoors and enjoying the beauty as well, in this, her garden fit for a queen. The garden invites visitors to stroll about. 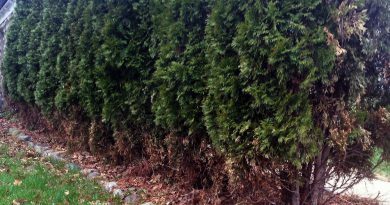 Neatly clipped bushes add to the regal flair. 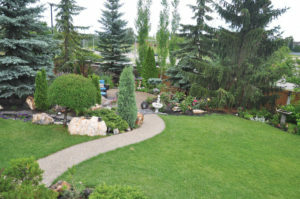 The frontyard displays unique trees and gardens. Manicured small beds add beauty to the frontyard. Driftwood and rocks lovingly collected from family trips. 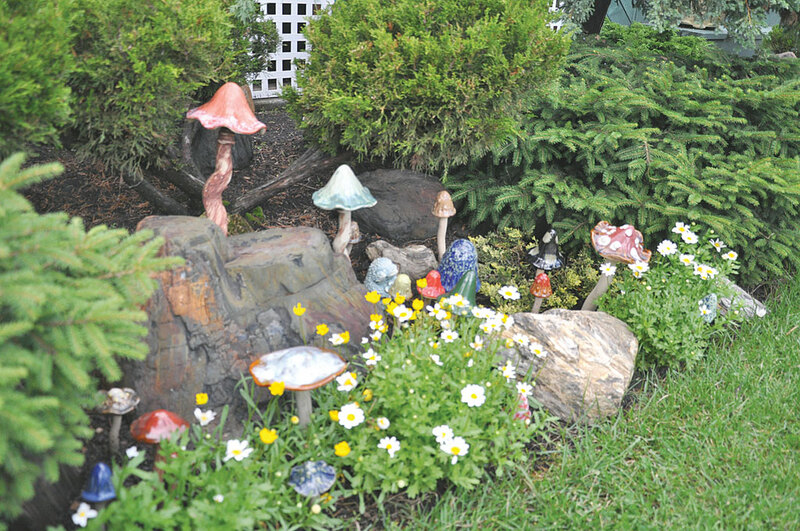 A lovely toadstool collection makes you wonder if fairies live here. 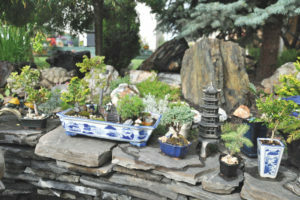 The rock wall offers a perfect spot to show off the bonsais. *Click photos for larger images.